I resent buying summer clothes. With my faulty internal thermostat and British summers typically lasting somewhere between ten days and four weeks there really seems little point in investing in garments that will see virtually no wear, and particularly not after the wash-out summer of last year. So now spring has finally arrived, I am planning to make the most of the lighter clothes I already have by digging into my ‘Make Do’ tool kit. I am in two minds about calling it that as ‘Make Do and Mend’ is such a worn out phrase. But recently I have been mulling over some aspects of voluntarily ‘making do’, from environmental dilemmas and ethical drivers to how it is often perceived. My shelf of summer clothes contained two items I have not worn in the last few years but I struggled to ‘dispose of’: a stone-coloured cotton skirt and a white linen shift dress. Both are ridiculously comfortable but have suffered at the hands of my tea habit. So this spring I focussed on how to rescue them. My first thought was to dye them but I was concerned about the water I would waste in the process. Also, no matter how much I dug around on the Dylon website, I could find nothing about the chemical make-up of the home dyes or their environmental implications. I could of course have tried my hand at natural dyes but most amateur efforts result in washed out greens or yellows, neither of which do my complexion any favours. So I dismissed dyeing. Next I flirted with patching the affected area, of the dress at least. Mr M actually prompted the idea with a reference to lace and it occurred to me that broderie anglaise over linen might look quite attractive, in a rustic way. On closer inspection, the tea stain on the dress was at its most intense over the chest so a lace patch would only draw attention to my bosom – not the desire effect! And then Mr M pointed out the blindingly obvious. Dyeing two items may not be environmentally virtuous but compared to ‘disposing’ of two serviceable garments and buying replacements that have undergone industrial dyeing, it would be the lesser of the two evils. So I bought some dye and salt and now have a deep green skirt and chocolate brown shift dress that give my summer wardrobe a very different feel. In fact, the strong colours make them both feel like completely new arrivals. Buying, and even not buying, new clothes involves many dilemmas, including countless ethical ones as the collapse of the Rana Plaza factory building in Dhaka has once again highlighted. * I shall explore how I (imperfectly) navigate some of the ethical dilemmas of buying and not buying in a future post, but this month I want to dwell on an ethical reason for ‘making do’ rather than taking clothes to a charity shop. In recent years the second-hand (often optimistically called vintage) clothes market has exploded. Bags of old clothes are regularly piled up outside the local charity shop but from talking to the shop’s volunteers it is clear that many people treat charities as an extension of the refuse collection system. Some donated clothes, like jackets and party dresses are quality items but many ‘donations’ are not fit for use as they are torn, stained or threadbare. And even if garments are in tact, they are often of poor quality due to the prevalence of fast fashion. Nevertheless, charities find ways to make the most out of donations. Some, like TRAID, mend and re-work clothes that have potential whilst selling sub-standard ones to be shredded and used as furniture stuffing. However, most donated clothes are sold in mixed bales to intermediaries for onward sale abroad. Whilst some charities, like Oxfam, manage the sorting and grading process themselves, many rely on commercial companies of various standards. As well as the impact of this practice on individual traders, there is also evidence that dumping our cast-offs on Africa has impeded the development of a local clothing industry, as African producers cannot compete with the cost of these cheap imports. On this basis, I think hard about which clothes I give to charity. Any items that are torn, stained, worn out… go into my inverted and I find another incarnation for them. 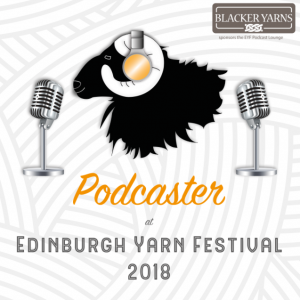 Last week I got caught up in an online discussion with Tom of Holland, Eirlys (aka Scrapiana) and Amy Twigger Holroyd about the meaning of ‘mending’ and ‘repairing’, particularly which word implied improving an item. Our exchanges prompted me to think more about the meaning of ‘Make Do’, or rather how it is and could be perceived. Perhaps it is due to the association with wartime shortages or our current culture of abundant choices, but ‘making do’ can sound like privation. It may feel virtuous but it could also imply we are being short changed as so much more is possible. However, what if we were to think of ourselves as a business and old clothes as assets or resources…? In this context, to ‘make do’ sounds more laudable, like efficient resource management. It could be said we are maximising outputs whilst minimising inputs, or even implementing a sensible waste management plan. By dyeing an old skirt to make it do for another season I save on an unnecessary purchase so I can ‘afford’ a pair of winter shoes that I am likely to need if we have another wet autumn. As such ‘making do’ is no different to a manufacturer patching up less frequently used machines so it can replace an essential one that suffers real wear and tear. And is reworking a dress with some dye, a new hem length and left-over lace trim not similar to a florist making attractive posies from leftover stems to turn waste into income…? I made one concession to summer shopping and bought a short sleeved cream T-shirt made from organic cotton (5 coupons). I also invested in a half slip made from rayon, which feels like a very wartime purchase (also 5 coupons). This hybrid fibre is made from wood pulp, which is technically a renewable resource but the production process has a pretty heft environmental footprint, hence the penalty coupon. I nevertheless allowed myself this ‘offending’ item as it will save me having to line lightweight skirts and dresses. By ‘making do’ I saved 14 coupons, seven for each of the dress and skirt. * There have been many articles and blog posts about the Rana Plaza garment factory collapse and what action we as ‘consumers’ can take. This one by Franca (who happens to be participating in this Wartime Wardrobe Challenge) stood out for me as she is one of the few voices to stress an elephant in the room: the competing tension between sustainability through reduced consumption and sustainability for individual workers due to better conditions. ** If you are interested in the practices and consequences of Europe, America and increasingly China dumping second hand clothes in African countries, take a look at this thorough article by Dr Andrew Brooks. I really like what you’re saying about mending vs charity shops. I do try to donate mainly good quality things, although I’m still not sure what I am supposed to do with not so good quality (but still wearable) clothes I don’t want any more and that don’t have an obvious refashioning option. There just doesn’t seem to be an alternative, the choices are hold onto it and don’t wear it, chuck it into landfill or donate, so charity shops seem the least bad option. Even if it’s made into scraps for car seats that’s still better than nothing. Of course, it’s best to only buy things you will like long term in the first place but tastes do change and for me often the clothes come from charity shops. 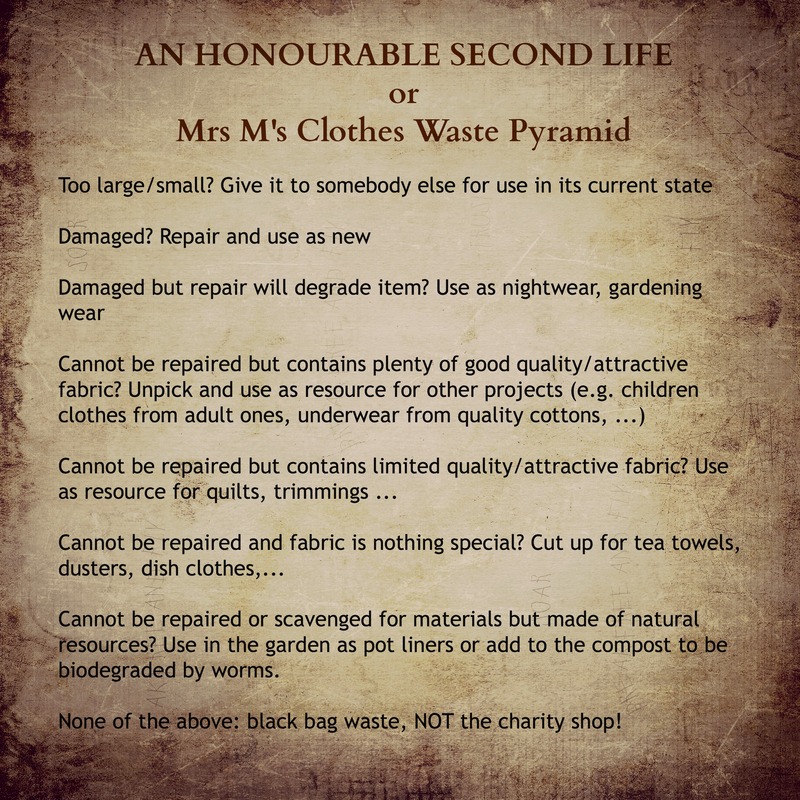 I figure most of the clothes I donate either end up on the “designer” rail of the charity shop and are therefore too valuable to send to Africa, or are beyond mending so end up in textile recycling – eg being made into cleaning cloths or filters. Great work on making your old clothes new! Hey, thanks for linking to that article. This month was mostly about me getting rid of clothes. I was gifted five outfits of gently used work clothes by 2 family members this month but dropped off several large bins of clothes to a local charity as I cleaned out my closet last month. I think the hardest thing for many of us Americans is coming to the realization that throwing something away, even if you really have “no other choice” is realizing that away is someone else’s space.